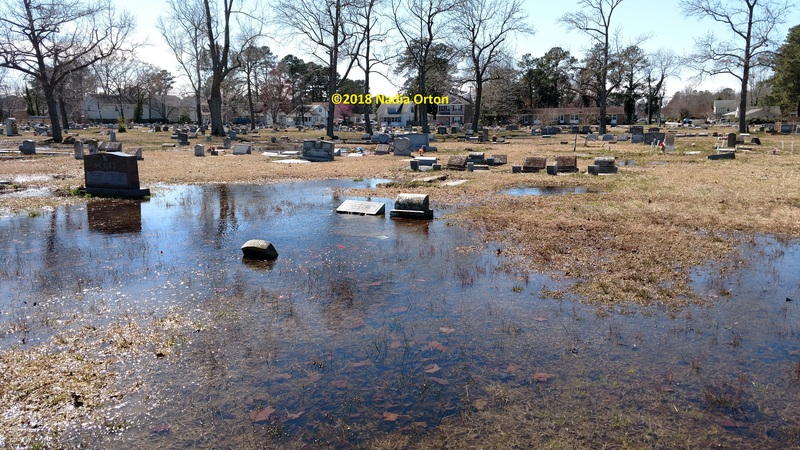 No section of the historic burial ground was spared, and hundreds of grave markers were barely visible beneath the rippling pools of water, mud, and random trash blown in from the roadway. I tried to muster my game face, and family members made a comment that was both practical and dispiriting. “I hope your boots don’t start leaking!” Sigh. This visit was supposed to be a positive one. We were there to mark the gravesite of Pvt. Albert Jones, a member of the 1st Regiment, U. S. Colored Cavalry. He died in a terrible house fire in 1940 at the age of one hundred and two, and for over seventy-eight years, had rested in an unmarked grave. In February, we submitted a request for a new headstone for Pvt. Jones, which was recently approved by the Department of Veterans Affairs and delivered to a local monument company for installation. It seemed a simple task: go to the cemetery, and flag his gravesite for the monument company. But the flood waters made the simple act of marking Albert’s grave practically impossible. Not long ago, I discovered Albert’s slave narrative, recorded in 1938 as part of the Works Progress Administration. Through it, I had the opportunity to learn details of his life not found in any other source. It’s simply stunning, reading first person testimony, feeling the inherent power of the words. Albert described being born enslaved in Southampton County, Virginia, site of the Nat Turner Rebellion in 1831. Though he never shared his name, Albert stated that his owner was relatively decent. However, if the owner found any books, paper, or other reading or writing materials in the hands of the enslaved, they would be beaten or otherwise severely punished. Albert had remained on the plantation until the age of twenty-one, when he’d escaped with his brother, and enlisted in the Union Army on December 3, 1864, at Newport News, Virginia. In the narrative, he described the living conditions in the Federal camps, and the roles of African American women there who’d joined their husbands in their flight to freedom. Learning these fascinating tidbits about his life, coupled with the tragic way that he died, made me determined to mark Albert’s grave. He’d begun to feel like a long-lost member of our family. 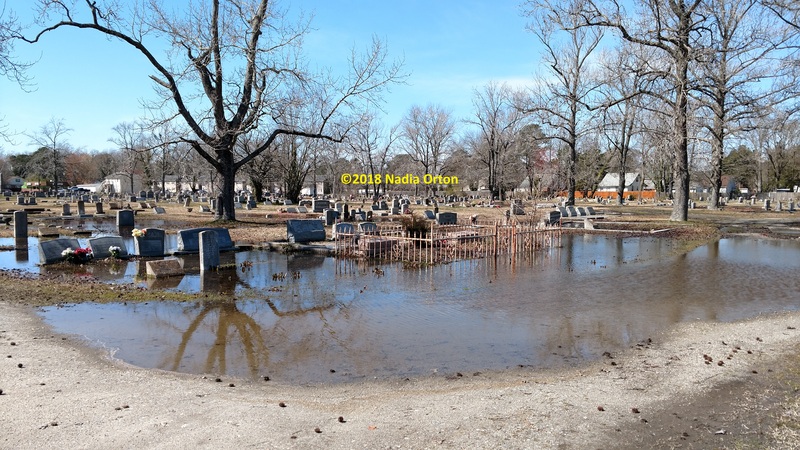 So as we would with any other family member, we tried to find his grave despite the flooding. But good intentions aside, there was no way it was going to happen that day…the whole area was underwater, a foot deep in some sections. Albert would have to wait, again. Disappointed, I began to make my way back to the car, but was soon distracted by another grave. 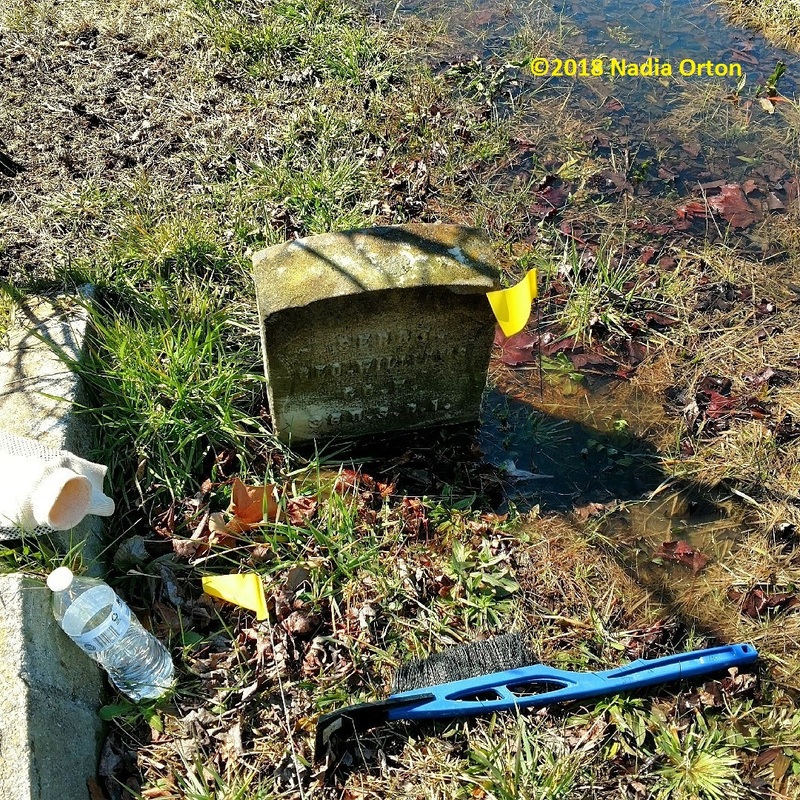 It was a headstone of government-issue, and judging by its weathered appearance, a very old one. Mindful of the sodden ground and flood waters, I leaned down as close as I dared, and made out a very faint inscription. “____ Williams, Co. __, __ U. S. C. I.” It certainly wasn’t Albert, so who was this? Had I found another United States Colored Troop? I trudged back to the car a little faster, and retrieved a pair of gloves, an old towel, and our trusty brush/ice-scraper for an impromptu cleaning (brush for the stone, ice-scraper for the mud at the base). After a few minutes, the inscription was clear enough to read: “Sergt. Geo. Williams/Co. F/36 U. S. C. I.” Indeed, I had discovered another freedom fighter. The rediscovered grave of Sgt. George Williams, Company F, 36th U. S. Colored Infantry. Lincoln Memorial Cemetery. Photo: Nadia K. Orton, March 22, 2018. Returning home, I looked up Sgt. Williams’ service record. He was born about 1843 in Suffolk, Virginia, and described as five feet, five inches tall, with “black eyes, complexion, and hair,” occupation farmer. He’d enlisted on August 13, 1863, in Norfolk, Virginia, and mustered in at Portsmouth on October 28th. While his service record doesn’t indicate his participation in any battles, it does note his intermittent assignments with the Quartermaster Department. He was appointed Corporal on September 9, 1863, and Sergeant on July 24, 1866. He mustered out on August 13, 1866, at Brazos Santiago, Texas, after a term of three years. Enlistment record of Sgt. George Williams, 36th U. S.Colored Infantry. testimony of their children, both George and Jennie had ancestral ties to Richmond, Virginia. In the 1870 and 1880 census, George, Jennie and family were documented in Portsmouth, with George working as a general laborer. 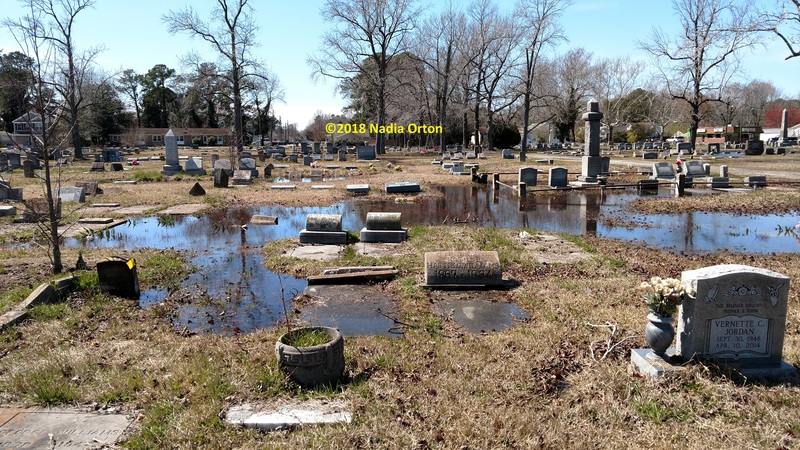 Not having much luck finding the family in the 1900 census, I did learn that Jennie Knight Williams passed away in 1909, and was interred in Mount Olive Cemetery, the oldest cemetery in the historic Mount Calvary Cemetery Complex, Portsmouth. To date, Jennie’s grave has not been located. In Lincoln Memorial Cemetery, Sgt. George Williams is interred with several other family members, Present are the graves of some of his children, including sons George, Jr. (1878-1941), and Edward (Edinborough) (1866-1934). 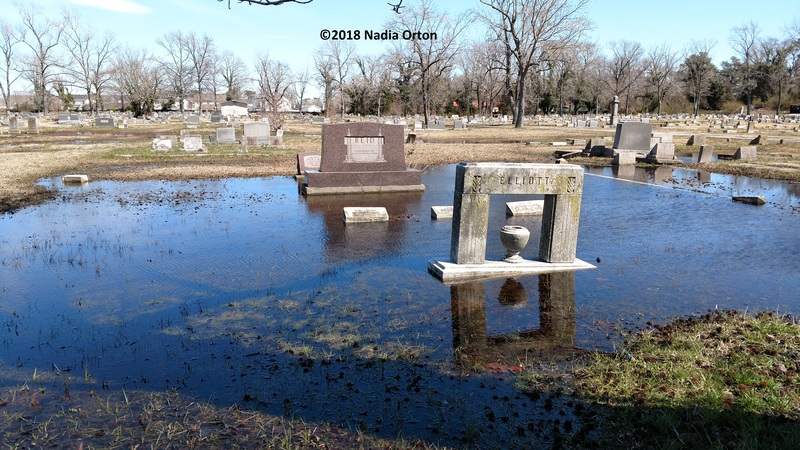 Edward (Edinborough) Williams is interred next to his wife, Hattie A. Churchwell Williams (1867-1934), daughter of Isaac and Ellen Churchwell, free persons of color. Central portion of Lincoln Memorial Cemetery. The Williams Family plot is on the lower left. 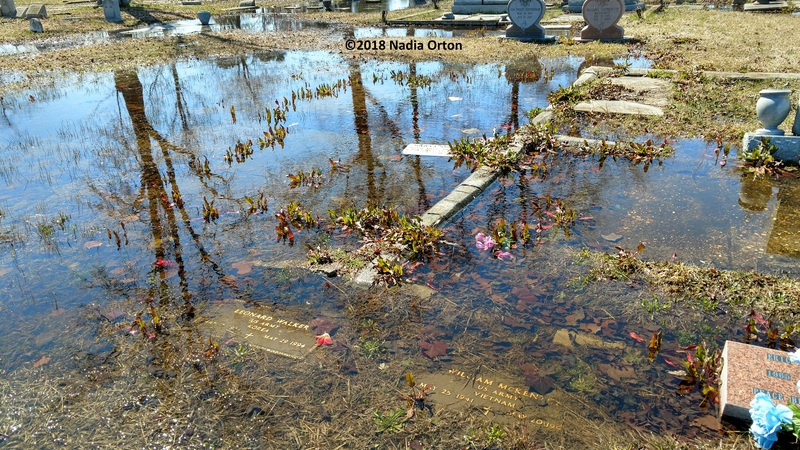 Photo: Nadia K. Orton, March 22, 2018. Over the years, flooding hasn’t spared Sgt. George William’s family plot either. Edward’s (Edinborough’s) gravestone is currently upside down, and his wife Hattie’s has shifted slowly to the right of its original location. And I’ve come to wonder how Sgt. George Williams is even buried in Lincoln Memorial. After all, according to military records, he’d died about 1901, and yet the earliest recorded burials in Lincoln Memorial began in 1913. One possibility is that Sgt. Williams’ children had his grave moved to Lincoln after the Mt. Calvary Cemetery Complex became increasingly overgrown in the 1940s. It wouldn’t be the first instance of grave relocations to Lincoln from other historically African American burial grounds in the area. The family of realtor and businessman Thomas William Newbie (1879-1936), had done the same in the 1970s, and the grave of Sgt. Lewis Rodgers (1844-1884), of the 28th U. S. Colored Infantry, was moved to Lincoln during the construction of Portsmouth’s historic Truxtun community in 1919. Although George rests among family in Lincoln Memorial, it’s still somewhat disheartening to think of him resting apart from his wife, Jennie, buried somewhere in the rear of the Mt. Calvary Cemetery Complex. There’s a logical conclusion; George’s children had moved the only ancestral grave they could find amidst the overgrowth. Perhaps fate is the reason why I stumbled across Sgt. Williams’ gravesite, to help tell his family story. 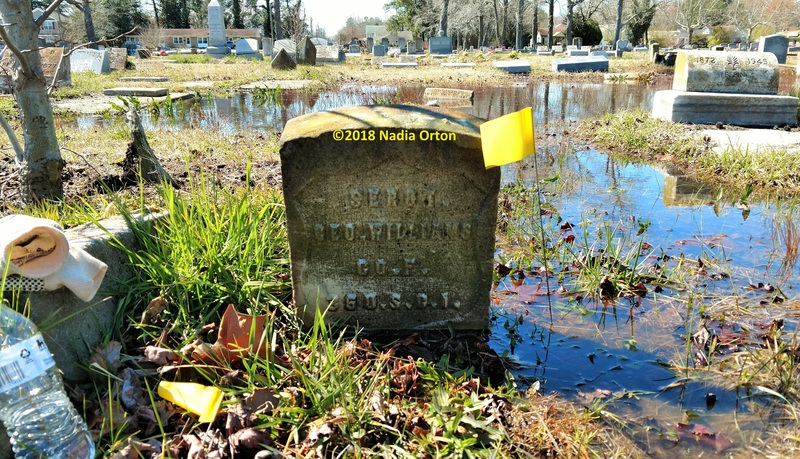 Or maybe I just got lucky, spotting the grave of a local freedom fighter I didn’t expect to find while carefully tracing a path amidst flood waters and sunken graves. Or maybe I’m just overthinking again, and the buzzing sounds in my ear are my annoyed ancestors telling me to just be happy with the discovery. Either way, finding Sgt. George Williams is a great reminder that in cemetery preservation, despite all disappointments, the delays, lack of funding, cooperation, and in my case, chronic health issues, there are still wonderful discoveries to be made that keep the awful tug of hopelessness at bay. The job’s never a small task, but every little bit helps the larger goal. You have to keep trying, no matter what.